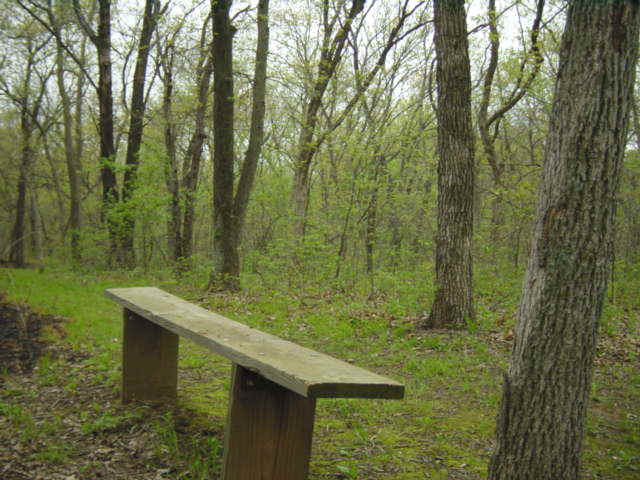 One of several benches along the hiking trails. - All photos on this page by Jim Mason Quaint and colorful! An oak-hickory-bluestem mix at the southern edge of the Glaciated Region is the quiet, natural setting for the Green Memorial Wildlife Area. 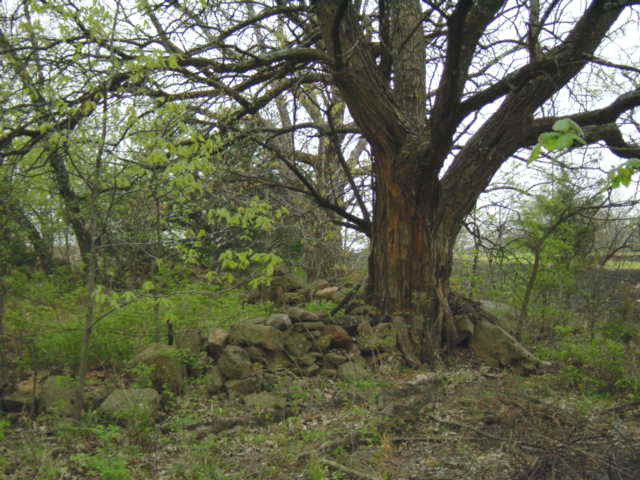 Restored bluestem prairie, oak-hickory hillsides, and a bubbly brook are the intermingling habitats at this site. The pink quartzite rocks you will see here and there were transported from South Dakota by glaciers during the Kansan Ice Age. Shingle oak, red oak, redbud, pawpaw, and western buckeye make up the woodlands. Spring through fall, Wildflowers such as ox-eye daisy, coneflowers, compass plant, penstemon, black sampson, and black-eyed Susan are seen in the prairie plots. Wildlife food is provided by Wild gooseberry, elderberry, black raspberry, highbush blackberry, Wild strawberry, and riverbank and raccoon grape. Look for five-lined skinks, racers, and ornate box turtles. Cricket frogs frequently call on spring and summer nights. The nests of eastern woodrats can be found in rock crevices. Signs of coyotes, raccoons, red foxes, and white-tailed deer are abundant. Great horned owls, downy and red-bellied woodpeckers, cardinals, blue jays, vireos, and warblers are found in the woods. Upland sandpipers, eastern meadowlarks, scissor-tailed flycatchers, eastern kingbirds, red-tailed hawks, American kestrels, and northern harriers can be seen in the grasslands. This property has a rich cultural history. It was the site of Uniontown, one of the early Kansas settlements (1848 - 1859). Old stone fences, historic gravestones and abandoned farm implements speak of the past inhabitants. The sloping grade of the Oregon Trail can be readily seen at the south edge of the property. 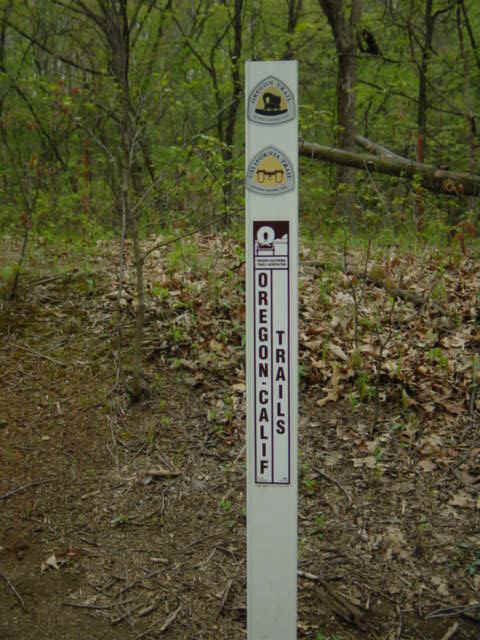 This sign is at marker #12 on the Oregon Trace hiking trail. Post Creek Trail (1 mile); Oregon Trace Trail (0.75 mile). Click the icon to find a birding list for Shawnee County. Directions: From Topeka, take 1-70 10 miles west to exit 346. Go 2.5 miles north to Willard. Take 2nd Street 0.5 miles east to Gilkerson Street. Follow Gilkerson 0.7 miles south to the parking area (red dot). Visit their website to download the brochure for this area.